Netflix and Marvel need to start thinking outside the box before audiences drift away — or Disney steals them. Marvel fans should be worried. The Netflix shows are not without their flaws, but allowing them to die would be a real loss for the genre. The timing is not great for Netflix, which released the third season of sibling show “Daredevil” on Friday, Oct. 19. The bigger problem here is that Netflix originally designed these shows to intersect but has been inconsistent in doing so, leaving some storylines feeling unmoored. It was an interesting experiment, but for it to successfully continue, Netflix will have to figure out a way for the various plots to stand on their own — and more interesting ways to get them to work together. If Netflix can’t find a way to do this, Marvel’s parent company Disney is liable to dominate the superhero landscape on TV going forward as their new streaming service becomes the (much more family friendly) choice for Marvel starting in 2019. There are already Marvel Cinematic Universe (MCU) shows on several different networks, most of which are at least partially owned by Disney. Netflix is the only non-Disney owned company currently producing MCU series. This is due in large part to Netflix’s unparalleled commitment to the Marvel community, as the ambitious slate of interlocking plotlines proves. “The Avengers” was the highest grossing movie of all time when it arrived in 2012. In contrast, “The Defenders” was the first Netflix Marvel series not to get automatically renewed for a second season. The problem is, for all its success, Netflix hasn’t been able to keep it up with Hollywood. “The Avengers” was the highest grossing movie of all time when it arrived in 2012. 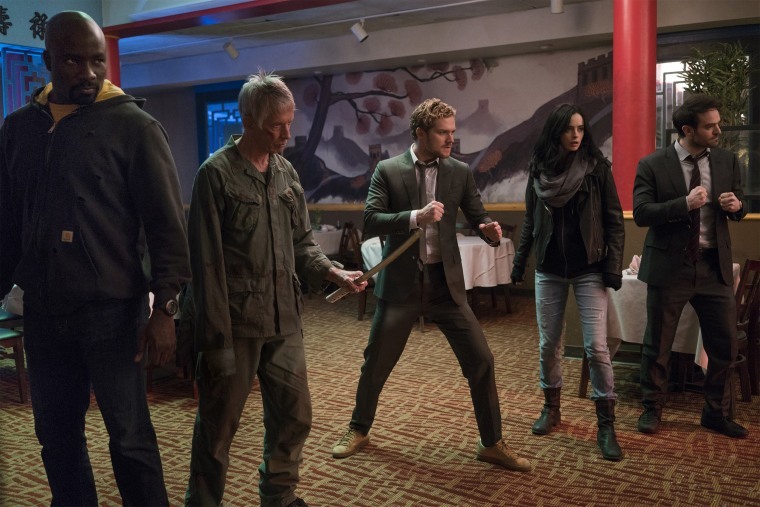 In contrast, “The Defenders” was the first Netflix Marvel series not to get automatically renewed for a second season. And by releasing no less than five series in the space of 12 months, showrunners are clearly running out of ideas. Watching the early episodes of “Daredevil” season three, one can spot recycled plot points at every turn: This pro-prison stance echoes the “The Punisher,” that imagined antagonist feels straight out of “Jessica Jones.” What once was new has started to feel repetitive. So what can Netflix do? One potential fix would involve shortening the seasons from 10-13 episodes to something more manageable. Too many of seasons have included what feels like two distinct story arcs, each of which run about six episodes long. The second seasons of “Luke Cage” and “Iron Fist” tried to move away from this formula, but “Daredevil” season three once again reuses the format, with a classic pivot moment occurring in episode six. Speaking of overused formats, spacing the releases better should also be a priority. Even Marvel Studios only releases three films a year, which is already so many the MCU is regularly accused of saturating the market. But most of all, Netflix needs to find better ways of connecting the series, without undermining each standalone story. This doesn’t mean Netflix has to bring back the mediocre “Defenders;” instead it could spin up a female-lead series starring Colleen Wing (from “Iron Fist”) and Misty Knight (from “Luke Cage”) with Jessica Jones and Karen Page from “Daredevil” as allies. The comics have already done this with “Daughters of the Dragon” — why shouldn't TV follow that example? And especially now that “Luke Cage” also hasn’t been green-lit for another season, there’s the possibility of putting the canceled shows together in a “Heroes For Hire” series. Whatever happens, Netflix and Marvel need to start thinking outside the box they’ve stuck themselves in. Otherwise audiences are going to drift away, and more shows are going to get canned. And that would be a real loss for superhero storytelling.